Vampires, Guns & Rock n’ Roll is a metal-slug like, 2d Pixel Art shooter game with guns, gore, action and vampires, set in the 80s. It is mid way through its prototype phase. 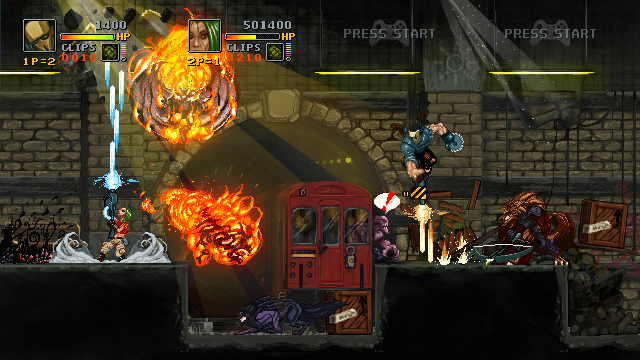 The player shoots his way through hordes of enemies, improves his best score, plays with friends and unlocks new characters. Levels are partially destructible. Shooting at the roof to get sunlight in the building will kill vampires and hinder other enemies. Light may also reveal hidden passages, while shadows will conceal the main character. Some levels have an alternative gameplay featuring vehicles (motorcycles, tanks, helicopters, harpies, etc). Online leader-boards will push the player to improve their score. We are currently talking with publishers, but feel free to contact us to know more!